The egg is a low-calorie powerhouse. The egg is a great source of nutrition and brain food, with only 80 calories per large egg and a useful 6 grams of protein. Even scrambled or fried in butter, they are still under a 100 calories per egg with only 1g of carb. Eggs provide protein, which helps you feel full longer. An egg supplies many essential nutrients including vitamin A, the B vitamins B-12, riboflavin, and folacin, and the minerals iron, phosphorus, and zinc, along with choline and DHA, essential nutrients for brain. The egg has less cholesterol than we thought. 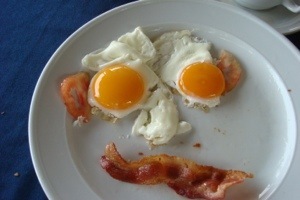 It turns out early tests measured falsely high for the amount of cholesterol in an egg, unfairly giving it a bad rap. One large egg has 213 milligrams of cholesterol. Egg whites can be part of your daily menu. It’s best to eat no more than three or four whole eggs per week, but egg whites have only 15 calories per egg, no cholesterol, and no saturated fat, so dieters can eat as many as they want. Eggs are an inexpensive protein source. Eggs are economical, especially when compared to steak or even a hamburger. You can run through a fast food restaurant in the mornings and for less than $2.00, you can get a side of two scrambled or fried eggs. There are many ways to cook eggs. Hard-boiled eggs are great to have in the fridge to grab and pop in your mouth when you don’t have time for breakfast. You can also fry, poach, devil, scramble, frittata, and have them with a slice of bacon. Sometimes, I use them in a sandwich made with Western Bagel Perfect 10 bagel after a workout. Eggs aren’t only for breakfast. Don’t dismiss eggs as a great dinner food,” It takes a mere couple of minutes to whip up an omelet, so you can keep eggs in the fridge for quick dinners when you get home and are too tired to cook or go out. A two-egg omelet (with spinach and mushrooms, and sometimes a slice of low-fat cheese or feta cheese) with grilled tomatoes and a serving of fruit is the perfect low-carb meal. Sliced hard-boiled eggs taste great in a salad. Organic eggs are more favorable and taste even better than regular eggs. Even Costco carries organic eggs. If you haven’t tried them. Do it this week. Stop having cereal for breakfast. There are so many carbs in a cup of cereal and I guarantee you that you eat more than one cup. Some cereals are more sugary than others, like Honey Nut Cheerios. Even the lower sugar cereal, Cheerios or Special K, have 30g of carbs per cup. Remember: One egg has just 1g of carbs. Even oatmeal has about 30g of carbs per cup. The nutrients you would be getting from these heavy carb foods, you could get in eating salads, vegetables and proteins. You don’t really need the wheat and oats in your diet. Want fiber? Eat nuts, fruit and vegetables.